Harold Avery Watts was born on 14th August 1889 in Dawesley SA. He was the sixth of ten children that was born and raised in the Nairn district. Upon his marriage to Edith Slater, Harold moved to Milang to manage the Cheese and Bacon factory, which still stands overlooking Lake Alexandrina. At the age of 27 he enlisted in the 32nd Battalion AIF on the 15th August 1916. Leaving his wife and daughter Elsie aged 18 months and son Harry just 2 months behind in Milang. Harold followed his younger brother, 21 year old Frank Perry Watts who enlisted on the 15th September 1915 initially as a driver. He later trained as a pilot and joined the flying corp. Harold visited Frank in Denham during his training. Frank returned home safely in 1919, although earlier had been seriously wounded when shot down in his RE8 Aircraft. Harold was with the 32nd as it fought its last major battle of the war between 29 September and 1 October with the 5th and 3rd Australian Divisions and two American divisions attached the Hindenburg Line across the top of the 6 kilometre long St Quentin Canal tunnel. The canal was a major obstacle in the German defensive scheme and was fiercely defended. With the help of the 30th American Division, the 32nd Battalion as part of the 5th Australian Division captured the heavily fortified village of Bellicourt. The Gun (no. 4452) on display in Meningie’s Memorial Park was one of four captured later in the day after taking the village of Nauroy near a farm called Etricourt. 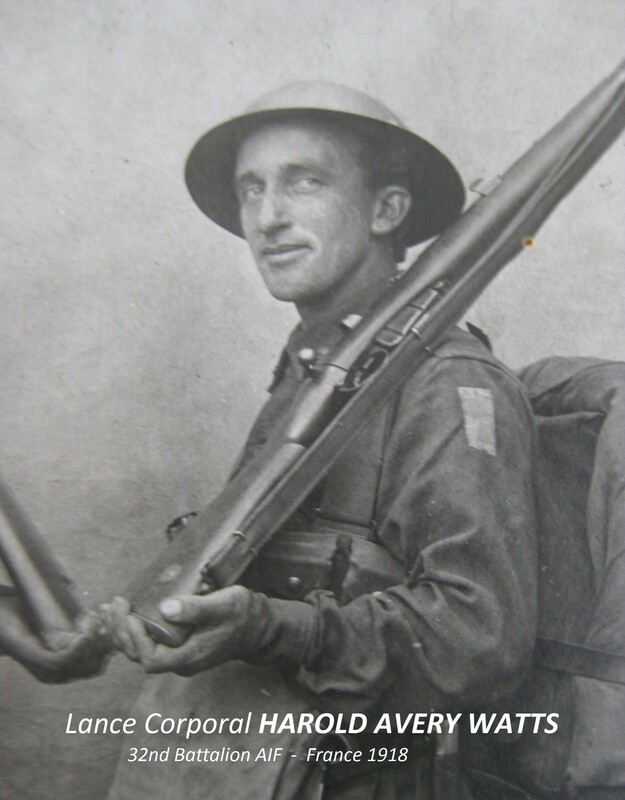 Edith, Harold’s wife was told later that he lead a group of 5-6 men to clear the St Quentin Tunnel, dawn 29th September 1918. Harold and his men were killed and were buried near by 5 weeks before the end of the war. In March 1920 the bodies were exhumed and re-interred in the British cemetery in Bellicourt. They say this was the “last great battle in which the battalion took part. It was to be a stunning victory for them, capturing the St Quentin Canal and part of the Hindenburg Line. The performance was their best and the best for the brigade.” 27,000 of them had been killed or wounded in three months. Harold is buried in the Bellicourt British Cemetery in grave reference III.A.1.